Astronomers have used the National Science Foundation's Very Long Baseline Array (VLBA) radio telescope to make the first-ever time-lapse "movie" showing details of gas motions around a star other than our Sun. The study, the largest observational project yet undertaken using Very Long Baseline Interferometry, has produced surprising results that indicate scientists do not fully understand stellar atmospheres. The "movie" shows that the atmosphere of a pulsating star more than 1,000 light-years away continues to expand during a part of the star's pulsation period in which astronomers expected it to start contracting. Philip Diamond and Athol Kemball, of the National Radio Astronomy Observatory (NRAO) in Socorro, New Mexico, announced their findings at the American Astronomical Society's meeting in Austin, TX, today. "The continued expansion we're seeing contradicts current theoretical models for how these stars work," Diamond said. "The models have assumed spherical symmetry in the star's atmosphere, and our movie shows that this is not the case. Such models suggest that a shock wave passes outward from the star. Once it's passed, then the atmosphere should begin to contract because of the star's gravity. We've long passed that point and the contraction has not begun." The time-lapse images show that the gas motions are not uniform around the star. Most of the motion is that of gas moving directly outward from the star's surface. However, in about one-fourth of the ring, there are peculiar motions that do not fit this pattern. The scientists speculate that the rate of mass loss may not be the same from all parts of the star's surface. "A similar star behaved as predicted when studied a few years ago, so we're left to wonder what's different about this one," Diamond said. "Right now, we think that different rates of mass loss in the two stars may be the cause of the difference. This star is losing mass at 100 times the rate of the star in the earlier study." "This is the first time anyone has been able to follow the motions of gas in the atmosphere of any star other than the sun. Our results raise a lot of questions that we can't answer yet, but this will give the theorists new information to work with," said Diamond. The star, called TX Cam, in the constellation Camelopardalis, is a variable star whose brightness changes regularly over a period of 557 days. In 1997, the NRAO astronomers began a series of observations aimed at tracking gas motions in the star's outer atmosphere through a full pulsation cycle. Observing with the VLBA every two weeks, they now have accumulated 37 separate images, which they combined to make the "movie." They were able to measure the gas motions because one of the gases in the star's atmosphere, Silicon Monoxide (SiO), can act as a natural amplifier of radio signals. Such cosmic masers amplify radio emission similar to the way that a laser amplifies light emission. Regions where this maser activity occurs appear as bright spots on radio telescope images when the telescope's receivers are tuned to the specific frequency emitted by the masers. With the extremely high resolving power, or ability to see detail, of the VLBA, the astronomers were able to follow the motions of individual maser regions within the star's atmosphere. These served as tracers of overall gas motions. "Such a study only became possible when the VLBA became operational, and with the availability of computers able to handle the quantity of data produced," Kemball said. The SiO maser regions appear to form a ring around the star. The ring's diameter is greater than the distance from the Sun to Saturn, and has expanded from 10 to 20 percent over the course of the VLBA observations. "The continued expansion was our first surprise, but we've only scratched the surface of the immense amount of data our observations have produced," Diamond said. "Since we think that magnetic fields are playing a large role in how this gas behaves, we're going to do further analysis of the data to try to confirm this." 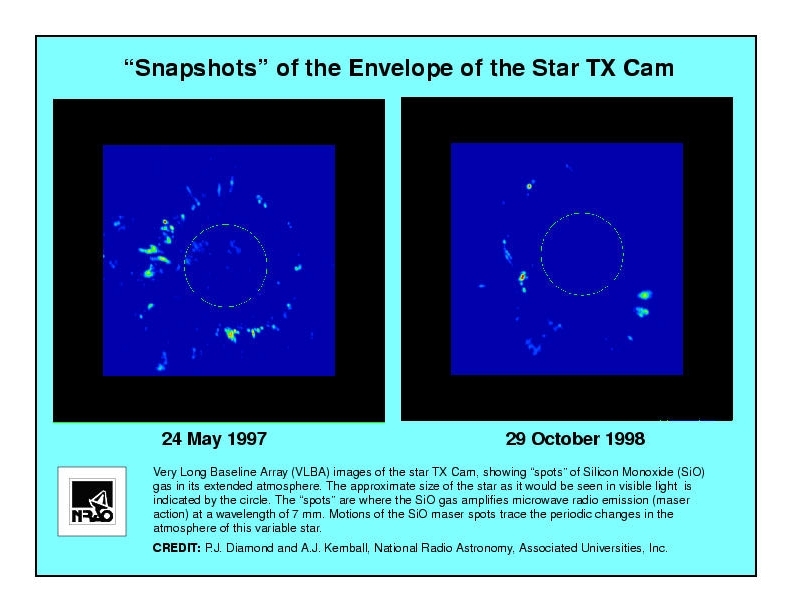 Other studies using the VLBA data will seek to learn additional details about the structure, motions, time evolution, mass-loss process, magnetic field structure and physical conditions in the inner regions of the envelope of gas surrounding TX Cam. The VLBA is a continent-wide system of ten radio telescope antennas, each 25 meters (82 feet) in diameter and weighing 240 tons. They are distributed across the continental U.S., Hawaii and the U.S. Virgin Islands. Operated from a control center in Socorro, New Mexico, all ten antennas work together as if they were a single telescope more than 5,000 miles in diameter. This allows the VLBA to produce radio images hundreds of times more detailed than the Hubble Space Telescope produces using visible light.